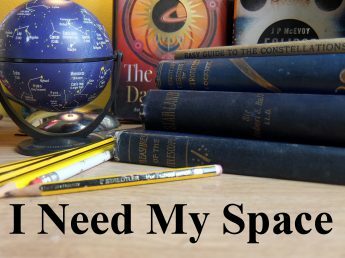 A lunar quickie | I Need my Space! I took another Moon photo through the little 4″ earlier, and it looks like I’ve caught it on the same day as the previous photo, but a few hours before. It looks like we’re in for a spell of clear skies, so I’m going to try to be organised and kit the van out full of astro gear, in preparation for the Wolverhampton Astronomy Society observation session this coming Tuesday. Anyway, the photo, I’m wondering why the top half of the image isn’t sharp. Has the mirror on the scope fell out of line? (a disadvantage of keeping it in the van? I’ve had things mysteriously ‘unscrew’ on my larger scope). Anyway, the Montes Apenninus is very blurred, compared to the craters in the Southern Highlands. But compare it to the shot I took in April, below, with the 8″ Skywatcher. That’s in a different league. I seem to remember the Moon being higher in the sky than it was tonight. And that, coupled with the larger mirror, meant the clarity was much better than what I’m getting from the smaller Skywatcher. So far, this is the best night’s shooting I’ve done on the Moon. I’d love to capture the Bay of Rainbows in such clarity.